Google is aware of the issue, but at the moment the only recommendation seems to be the good old "turn it off and turn it on again." As the de facto flagship phone for Android (or at least that portion of Android that isn't covered in Samsung logos), the Nexus 6 gets an inordinate amount of attention. That's not always a good thing, especially when the hardware and/or software exhibits major flaws or defects. For example: a considerable number of users are reporting a total failure of their phone's mobile data connection. The problem is occurring on multiple software versions and across different carriers and locations. According to reports given directly to Android Police, the typical error starts randomly: the 3G or LTE connection fails, showing a "!" 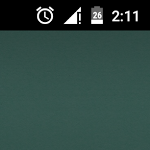 logo on top of the signal bar, whether or not a connection to the nearest tower is possible or a Wi-Fi connection is active. Rebooting the phone reportedly fixes the issue, but only for a few minutes, after which it comes right back. In threads on XDA and Reddit users are reporting remarkably similar experiences, all starting about five or six days ago. The problem seems to be affecting T-Mobile and Sprint network customers for the most part, though at least one XDA poster on Verizon and another in the United Kingdom say they've experienced the same issue. Users on various 5.0 and 5.1 are reporting similar results. (None of the Nexus 6 owners here at Android Police have experienced any notable problems.) At the time of writing there doesn't seem to be a reliable solution.